"Sausage and chili sauce add to the usual ground beef to make a great consistency and flavor for burgers." In a medium bowl, mix together the ground beef, Italian sausage, chili sauce, salt and pepper. 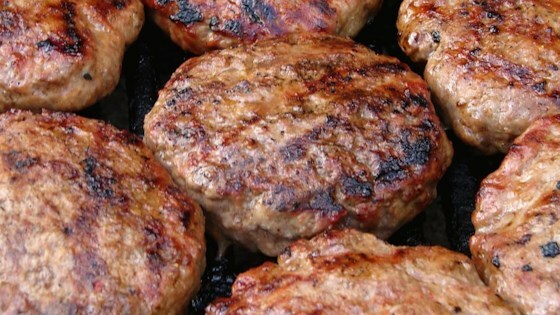 Form 8 balls out of the meat, and flatten into patties. Grill patties for 5 minutes per side, or until well done. Serve on buns with your favorite toppings. I found these burgers took forever to cook to proper temp and by that time they were dry as a bone? May be i didn't get something right, but they still were not good enough to make again. This recipe is awesome! Impress your friends with this one. I usually add a little garlic, too. Yummy! It was hard for me to want to put any other condiments on the burger! My advice would be to double the recipe! Everyone may want two! Made this last night, husband wants it again this week. I already had plain sausage on hand so I added oregano, basil, and garlic plus a little extra chile sauce. Good stuff! I was pleasantly surprised by this recipe. My family went wild for them. We made them into little "sliders" and cooked them on the Foreman grill. Mmmm. We'll be making this again! Careful with the sausage, too much can change the entire tone.